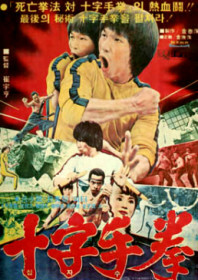 Halfway through this Bruceploitation flick, a Bruce Lee look-a-like (Bruce Le), wearing that legendary yellow jumpsuit, smashes his way into a pagoda and battles with an array of baddies on every level. There is a pretty good duel with Lee Hoi-san (playing a Shaolin monk with deadly balls), and a strange fight with a Snake Fist exponent who bites the heads off live snakes and wields them around his head. A decent nunchaku battle later and Bruce Le is running after a clichéd Japanese villain in possession of a “secret document” (no one really knows what it is) that somehow makes all of China vulnerable to a Japanese invasion. Where’s Bruce Lee when you need him? This is another grave-robbing exercise salvaged, if only slightly, by some familiar faces. AKA: Cross Hands Martial Arts; The King of Kung Fu.